Some people may have misinterpreted the content at the beginning of Chapter 3 in Python for Data Science for Dummies. It isn’t necessary to install the products listed in the Considering the Off-the-Shelf Cross-Platform Scientific Distributions section starting on Page 39. These products are for those of you who would like to try a development environment other than the one used in the book, which is Anaconda 2.1.0. 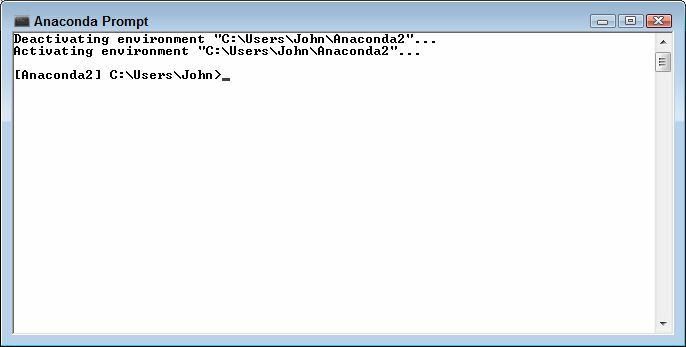 However, unless you’re an advanced user, it’s far better to install Anaconda 2.1.0 so that you can follow the exercises in the book without problem. Installing all of the products listed in Chapter 3 will result in a setup that won’t work at all because the various products will conflict with each other. Because Continuum has upgraded Anaconda, you need to download the 2.1.0 version from the archive at https://repo.continuum.io/archive/.There are separate downloads for Windows, Mac OS X, and Linux. The chapter tells you precisely which file to download. For example, for Windows you’d download Anaconda-2.1.0-Windows-x86_64.exe. The point is to use the same version of Anaconda as you find in the book. You can find the installation instructions on Page 41 if you have a Windows system, Page 45 if you have a Linux system, or Page 46 if you have a Mac OS X system. Make sure you download the databases for the book by using the procedures that start on page 47. Following this process is the best way to ensure you get a good installation for Python for Data Science for Dummies. Luca and I want to make certain that you can use the book to discover the wonders of data science without having to jump through a lot of hoops to do it. Please feel free to contact me at John@JohnMuellerBooks.com if you have any questions about the installation process. Both Python for Data Science for Dummies and Machine Learning for Dummies rely on a version of Anaconda that uses IPython as part of its offering.Theoretically, you could also use Anaconda with Beginning Programming with Python For Dummies, but that book is designed to provide you with an experience that relies on the strict Python offerings (without the use of external tools). In other words, the procedures in this third book are designed for use with IDLE, the IDE that comes with Python. IPython extends the development environment in a number of ways, one of which is the use of magic functions. You see the magic functions in the code of the first two books as calls that begin with either one or two percent signs (% or %%). The most common of these magic functions is %matplotlib, which controls how IPython Notebook or Jupyter Notebook display plot output from the code. You can find a listing of the most common magic functions in the Python for Data Science for Dummies Cheat Sheet. Neither of the first two books use any other magic functions, so this is also a complete list of magic functions that you can expect to find in our books. However, you might want to know more. Fortunately, the site at https://damontallen.github.io/IPython-quick-ref-sheets/ provides you with a complete listing of the magic commands (and a wealth of other information about IPython). Of course, you might choose to use another IDE—one that isn’t quite so magical as Anaconda provides through IPython. In this case, you need to remove those magic commands. Removing the commands won’t affect functionality of the code. The example will still work as explained in the book. However, the way that the IDE presents output could change. For example, instead of being inline, plots could appear in a separate window. Even though using a separate window is less convenient, either method works just fine. If you ever do encounter a magic function-related problem, please be sure to let me know at John@JohnMuellerBooks.com. 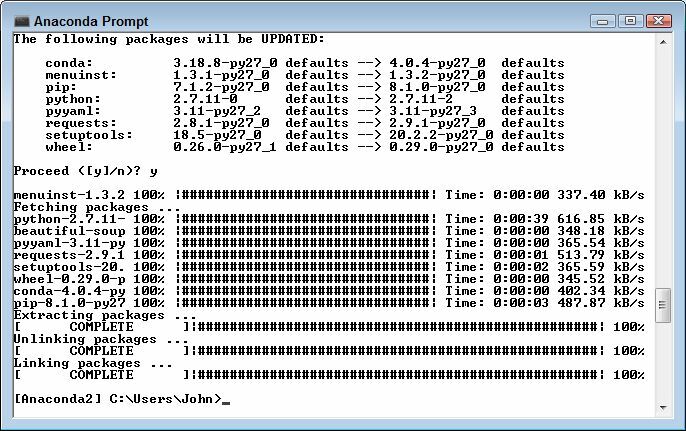 In the Installing Python Packages (Part 1) post, you discovered the easiest method of installing new packages when working with Beginning Programming with Python For Dummies, Python for Data Science for Dummies, and Machine Learning for Dummies. Using the pip command is both fast and easy. However, it doesn’t provide much in the way of feedback when things go wrong. 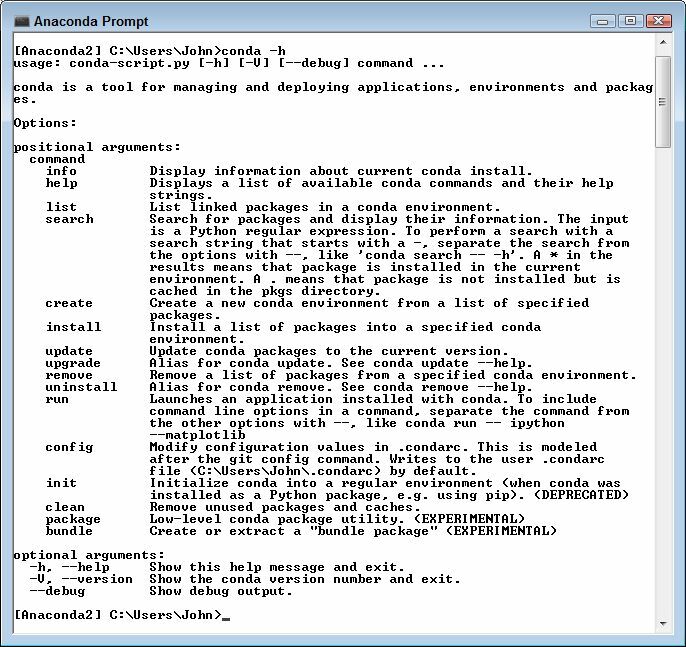 To overcome this issue, you can use the conda command in place of pip when you have Anaconda installed on your system. Like pip, conda supports a wide variety of commands. You can find a listing of these commands at http://conda.pydata.org/docs/using/pkgs.html. At this point, you have BeautifulSoup installed. Installing other packages follows the same path. Using conda does require a little more expertise than using pip, but you also gain additional flexibility and garner more information. When everything goes well, either tool does an equally good job of getting the installation or update task done, but conda excels in helping you past troublesome installations. Let me know your thoughts about using conda to install the packages required by my books at John@JohnMuellerBooks.com. The downloadable source for Python for Data Science for Dummies contains a problem that doesn’t actually appear in the book. If you look at page 221, the code block in the middle of the page contains a line saying import numpy as np. This line is essential because the code won’t run without it. The downloadable source for Chapter 12 is missing this line so the example doesn’t run. This P4DS4D; 12; Stretching Pythons Capabilities link provides you with a .ZIP file that contains the replacement source code. Simple remove the P4DS4D; 12; Stretching Pythons Capabilities.ipynb file from the archive and use it in place of your existing file. Luca and I always want you to have a great experience with our book, so keep those emails coming. Please let me know if you have any questions about source code file update at John@JohnMuellerBooks.com. I’m sorry about any errors that appear in the downloadable source and appreciate the readers who have pointed them out. Python for Data Science for Dummies contains two errors on page 145. The first error appears in the second paragraph on that page. You can safely disregard the sentence that reads, “The use_idf controls the use of inverse-document-frequency reweighting, which is turned off in this case.” The code doesn’t contain a reference to the use_idf parameter. However, you can read about it on the Scikit-Learn site. This parameter defaults to being turned on, which is how it’s used for the example. The second error is also in the second paragraph. The discussion references the tf_transformer.transform() method call. The actual method call is tfidf.transform(), which does appear in the sample code. The discussion about how the method works is correct, just the name of the object is wrong. Please let me know if you have any questions about either of these changes at John@JohnMuellerBooks.com. I’m sorry about any errors that appear in the book and appreciate the readers who have pointed them out. Python for Data Science for Dummies contains an error in the example that appears on the top half of page 124. In the first of the two grey boxes, the code computes the results of four print statements. The bottom-most print statement, print x[1:2, 1:2], is supposed to compute a result based on rows 1 and 2 of columns 1 and 2, and the bottom grey box seems to confirm that interpretation by the showing the result as [[[14 15 16] [17 18 19]] [[24 25 26] [27 28 29]]]. However, the answer provided for this example in the downloadable source code is [[[14 15 16]]], which doesn’t agree with that in the text. Please let me know if you have any questions about this example at John@JohnMuellerBooks.com. I’m sorry about the error that appears in the book and appreciate the readers who have pointed it out. Obviously, the situation is inconvenient for everyone, but the various libraries will get in sync sometime soon and then the warnings will disappear until the next set of updates. Please let me know if you continue to see problems after making this fix at John@JohnMuellerBooks.com.